Until the 1850's, Borysław was a sleepy, poor village not far from the market town of Drohobycz. In this area, crude oil, known as ropa, had always seeped up from the ground and polluted the water. However, it was only when it was successfully distilled into a pure liquid and a lamp was designed to burn this liquid, that was there an incentive to exploit these riches. From the 1850's, Jews were among the first to develop the petroleum resources. The population of the region exploded with the oil boom as workers, businessmen and professionals emigrated to the town. For more information on the history of the town, see the History of Borysław and Petroleum. This web page is part of a larger site, The Drohobycz Administrative District. The town of Drohobycz was the administrative centre of this district that was created in the province of Galicia in 1867 under Austrian rule. When referring to their place of origin, our ancestors often used the name of the nearest large town such as Drohobyz. However, we may discover that they were born in small villages nearby and used the names of the nearest large towns as a matter of convenience. Also, legal records of births, marriages, and deaths were made Drohobycz and after 1878 in Borysław. To see if your ancestors came from one of the smaller towns in the district, see Other Shtetls where you will find lists of the businessmen from the years 1891 and 1929. See also a History of Galicia for a general history of the province and of the Jews in this region. The people of the region come alive in photographs and memoirs in the section, Families. Drohobycz was closely allied with the neighbouring town of Borysław the centre of the petroleum industry. For more information on the town, see Borysław. 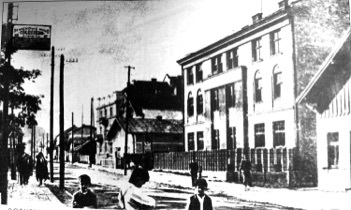 A great number of the Jews who lived in the Drohobycz area were involved in the petroleum industry. Drohobycz prospered as the administrative centre of these industries. For more information on this industry, see Petroleum. The Map section contains a number of maps that relate to the period before 1939. Centre of Polish oIl and gas industry: oil exploration, ozokerite exploitation, fabriction of mining equipment. In 1930-33, Borysław was given the right to be a city. Greater Borysław had absorbed the neighouring communities of Bania Kotowska, Hubicze, Mrażnica, and Tustanowice and became the largest city in the Borysław area. Total Population: 1900 – 10,690; 1929 – 16,099. Jewish Population: 1900 – 5,950; 1929 – 7.170. For more assistant, please contact the Webmaster. This page is hosted at no cost to the public by JewishGen, Inc., a non-profit corporation. If you feel there is a benefit to you in accessing this site, your JewishGenerosity is appreciated.